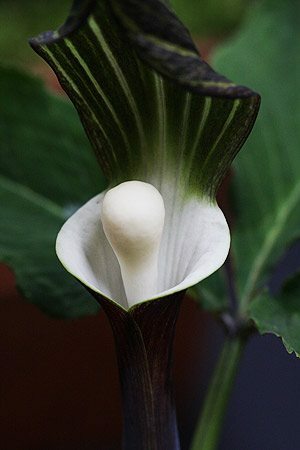 Flowering in spring , Arisaema sikokianum has dark purple spathe and a large white spadix with a real glow to it. The striped hood reaches upward and act as a backdrop to the spadix, just to add to the wonder of this flower which appears just before the foliage. The foliage itself is interesting with one, one trifolate or ‘three lobed leaf’ and one five lobed. Plant in the garden along with plants such as hostas, or grow in a container, both work well. Plants will reach around 24 inches ( 60cm) in height depending on conditions and actual plant. The darkness of spathe seems to vary a little from plant to plant. As these are a little slow they may cost a little more than some easier varieties. We find that this is one of the earliest species to flower, its flowers appear at the same time as the first host foliage. When planting mature bulbs, we suggest around 15cm deep, we grow these wonders in both the garden and in containers. We use terra cotta pots that are broad and deep. A relatively open potting mix for good drainage. We usually plant single large bulbs in each pot and let them ‘multiply’ for a few years before dividing and potting on. Fairly easy to grow, but sometimes a little slow from seed, Arisaema sikokianum prefers a part shaded position and a humus rich moist but well drained soil. Growing w ell in containers it does make a wonderful feature when in full flower.